Our Lady and St Patrick's School, Dumbarton moved into their new school in October 2017, previously recorded in our website. Some years ago the present head teacher, Christopher Smith expressed the desire to renew the relationship with the Sisters of Notre Dame. He and senior members of staff now attend the annual meeting of Notre Dame Schools. Students and staff took part in the celebration of the 150th anniversary of the birth of St. Julie in Liverpool Metropolitan Cathedral. However as the school had no statue of St. Julie the Sisters were asked if there was one to spare for their new school. 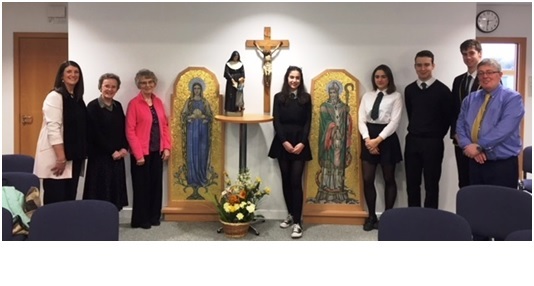 On 7th February members of our Leadership Team visited the school, taking with them a statue of St. Julie and a crucifix, both of which came from our Convent at 285 Woolton Road, Liverpool. They received a warm welcome from both staff and students and after a cup of tea were taken on a comprehensive tour of the school by Clare Mc Kernan and Dave Stuart, two of the deputy head teachers. The first port of call was the chapel, where Sisters Elizabeth and Ann presented the statue and the crucifix to members of staff and students gathered there and had the inevitable photographs taken.